Inverted Center Stamps of the World • View topic - Inverted Jenny! The Inverted Jenny (also known as an Upside Down Jenny or Jenny Invert) is a United States postage stamp first issued on May 10, 1918 in which the image of the Curtiss JN-4 airplane in the center of the design appears upside-down; it is probably the most famous error in American philately. Only one pane of 100 of the invert stamps was ever found, making this error one of the most prized in all philately. A center-line block catalogs for $600,000, which is probably low; a single inverted Jenny was sold at a Robert A. Siegel auction in November 2007 for US $977,500. In December 2007 a mint never hinged example was sold for $825,000. The broker of the sale said the buyer was a Wall Street executive who lost the auction the previous month. A block of four inverted Jennys was sold at a Robert A. Siegel auction in October 2005 for US $2.7 million. During the 1910s, the United States Post Office had made a number of experimental trials of carrying mail by air, and decided to inaugurate regular service on May 15, 1918, flying between Washington, D.C., Philadelphia, and New York City. 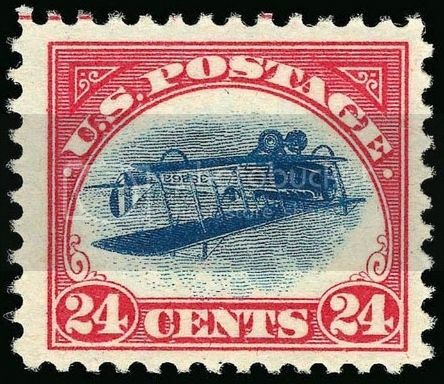 The Post Office set a controversial rate of 24 cents for the service, much higher than the 3 cents for first-class mail of the time, and decided to issue a new stamp just for this rate, patriotically printed in red and blue, and depicting a Curtiss Jenny, the biplane chosen to shuttle the mail. The job of designing and printing the new stamp was carried out in a great rush; engraving only began on May 4, and stamp printing on May 10 (a Friday), in sheets of 100 (contrary to the usual practice of printing 400 at a time and cutting into 100-stamp panes). Since the stamp was printed in two colors, each sheet had to be fed through the printing press twice, an error-prone process that had resulted in invert errors in stamps of 1869 and 1901, and at least three misprinted sheets were found during the production process and were destroyed. It is believed that only one misprinted sheet of 100 stamps got through unnoticed, and stamp collectors have spent the ensuing years trying to find them all. Many collectors long thought the blue plane portion was printed first, thus it was actually the red frames that were inverted. However, research by noted philatelic authors Henry Goodkind and George Amick shows this to be incorrect; in fact, the frames were printed first and it is the planes that are upside down. In examples where the plane is so far off center that it overlaps the frames, it can be seen that the blue ink used to print the plane lies atop the red ink used to print the frames. The Smithsonian's National Postal Museum offers two explanations for how this might have occurred: either a sheet of printed frames was fed into the press upside down for the printing of the plane; or the printing plate used to print the planes was mounted inverted within the printing press. Initial deliveries went to post offices on Monday, May 13. Aware of the potential for inverts, a number of collectors went to their local post offices to buy the new stamps and keep an eye out for errors. Collector William T. Robey was one of those; he had written to a friend on May 10 mentioning that "it would pay to be on the lookout for inverts". On May 14, Robey went to the post office to buy the new stamps, and as he wrote later, when the clerk brought out a sheet of inverts, "my heart stood still". He paid for the sheet, and asked to see more, but the remainder of the sheets were normal. Additional details of the day's events are not entirely certain—Robey gave three different accounts later—but he began to contact both stamp dealers and journalists, to tell them of his find. After a week that included visits from postal inspectors who tried to buy it back, and the hiding of the sheet under his mattress, Robey sold the sheet to noted Philadelphia dealer Eugene Klein for US$15,000. Klein then immediately resold the sheet to "Colonel" H. R. Green, son of Hetty Green, for US$20,000. Klein advised Green that the stamps would be worth more separately than as a single sheet, and Green went along; a block of eight and several blocks of four were broken from the sheet, with the remainder of the stamps sold individually. Green kept a number of the inverts, including one that was placed in a locket for his wife. This locket was offered for sale for the first time ever by the Siegel Auction Galleries Rarity Sale, held on May 18, 2002. It did not sell in the auction, but the philatelic press reported that a Private Treaty sale was arranged later for an unknown price. The philatelic literature has long stated that seven of the stamps have been lost or destroyed through theft or mishandling. However, this information needs updating; for in 2007 a copy came to light that had not been seen since Eugene Klein broke up the sheet, and was offered for auction that June. The number of lost stamps then became six. Several others have been damaged, including one that was sucked into a vacuum cleaner. Apparently Green's wife mailed one which, while recovered, is the only cancelled sample.